The Doctor hasn’t had the best of relations with the British monarchy. For example, Torchwood was founded by Queen Victoria to fight alien menaces such as the Doctor. 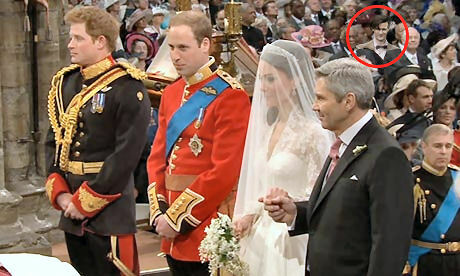 The Doctor loves to pop up at historical events, and his past misunderstandings with royalty didn’t prevent him from showing up at the wedding of William and Kate today as is seen in the picture above. (The picture was obtained here. You can take up any unfounded theories involving Photo Shop with them). 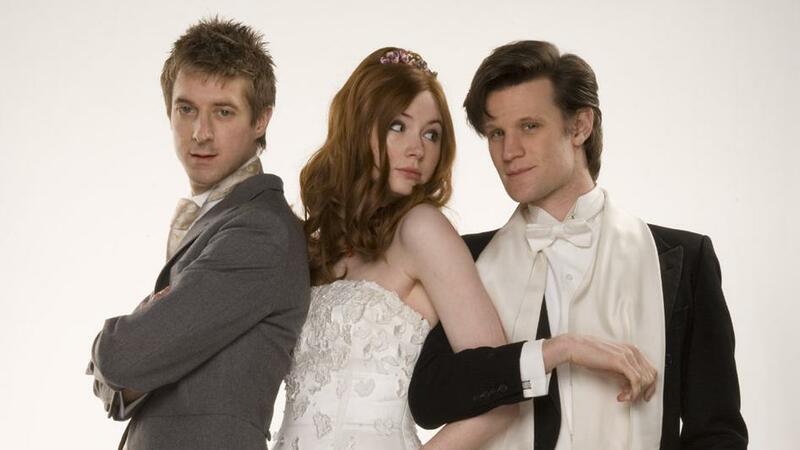 I’m only interested in weddings from the U.K. if they have something old, and something blue, like a TARDIS. 5. Claims he’s a baby when Obama is clearly an adult — It’s a forgery! 3. Document notarized by Magnum P.I. In 2008, in response to media inquiries, the President’s campaign requested his birth certificate from the state of Hawaii. The state sent the campaign the President’s birth certificate, the same legal documentation provided to all Hawaiians as proof of birth in state, and the campaign immediately posted it on the internet. That birth certificate can be seen here (PDF). When any citizen born in Hawaii requests their birth certificate, they receive exactly what the President received. In fact, the document posted on the campaign website is what Hawaiians use to get a driver’s license from the state and the document recognized by the Federal Government and the courts for all legal purposes. That’s because it is the birth certificate. This is not and should not be an open question. The President believed the distraction over his birth certificate wasn’t good for the country. It may have been good politics and good TV, but it was bad for the American people and distracting from the many challenges we face as a country. Therefore, the President directed his counsel to review the legal authority for seeking access to the long form certificate and to request on that basis that the Hawaii State Department of Health make an exception to release a copy of his long form birth certificate. They granted that exception in part because of the tremendous volume of requests they had been getting. President Barack Obama’s long form birth certificate can be seen here (PDF). Of course this won’t stop the false claims from the right any more than the bogus accusations against John Kerry stopped after he released his military records. The right wing attackers simply do not care about the truth, either in their personal attacks or in their discussion of policy matters. They lie because they know their views cannot stand up to the truth, and because their dominance over much of the news media allows them to get away with it. 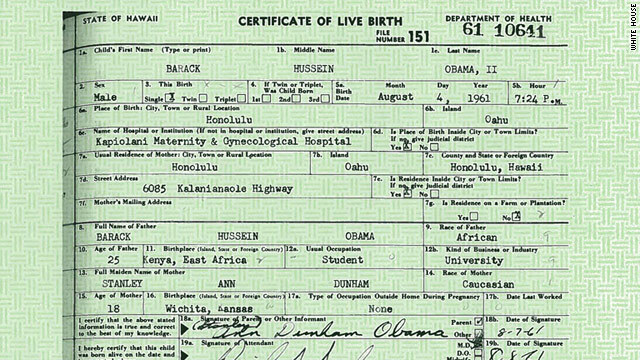 Many Birthers are now either questioning the validity of the birth certificate or claiming that this does not disprove their claim that Barack Obama is ineligible to be president. Leaders on the far right know that race-baiting works, and are not about to stop. Some are asking why it took Obama so long to release the long form. Birthers can use the delay to suggest fabrication. Some Obama supporters speculate that Obama was laying a clever trap which many Republicans walked into. My suspicion is that it is simply a matter of living in a bubble. In this case the bubble I’m referring to is not the one which encases all presidents, but the bubble that many politicians and bloggers live in. While the Birther arguments were commonly heard by those who watch Fox or read the blogs, until recently I bet most Americans didn’t even think about it. Those who did pay attention were people who would never vote for a black or a Democrat regardless of the facts, or liberal bloggers who were already debunking the claims. There was no reason for the White House to take the unusual action of having the long form released. Having a loud-mouth celebrity such as Donald Trump make an issue of this made it necessary for the White House to actually pay attention to this and arrange to have the long form released. Beyond the questions of whether the Birthers would cease their bogus attacks and why Obama took so long, the next question is whether this was a victory or defeat for Donald Trump. Some conservatives gave the point to Trump, and anyone who has every watched Trump would have expected that Trump would claim this as a victory. If Trump’s campaign is purely a gigantic publicity stunt to promote Trump’s ego, then in a way he did win. He forced the President of the United States to take unprecedented action in having the long form birth certificate made public. If the goal was to promote his show, Trump might have miscalculated. With the Republicans moving to the extreme plutocratic right, capitalists these days are increasingly Democrats, not Republicans. Viewership of Celebrity Apprentice tends to be more liberal than other “reality” shows, and Trump’s ridiculous attacks on Obama are costing him viewers. If we are to take Trump at his word that this is a legitimate presidential campaign, it is not clear if this helps or hurts him in the Republican primaries. Some of his Tea Party supporters might see this as a victory for Trump, but it also takes away Trump’s argument that Obama needs to release the long form. Continued attacks along these lines will only make him look more ridiculous to moderates. Over sixty percent of this country remains sane enough to never vote for people as nutty and unqualified as either Donald Trump or Sarah Palin. Trump’s problem is not that he needs more media coverage, but that people do not take him seriously. Being proven to be totally wrong on the major issue he is identified with hardly helps his credibility as a presidential candidate. Those following the story saw today that a major conservative argument, and a belief held by a substantial percentage of Republicans, is wrong. The bigger question is whether more people will go on from there to realize the same is true of pretty much everything conservatives are saying these days. Jackson also pointed to a broader pattern of hostility towards civil rights — pointing to a number of events, including the battle over public sector unions, a transportation policy that he says disadvantages poor minority city dwellers, and a renewed interest in policies like voter ID.